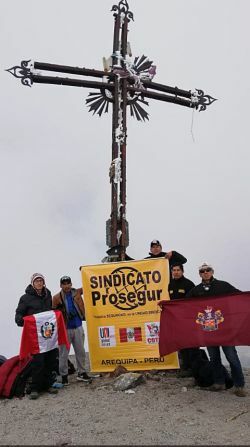 Members of the Peruvian union SinTraProsegur spent part of their Easter holiday weekend climbing Misti, a dormant volcano. The motto for their climb was "Throughout Peru we continue to grow with dignity!" (Photo: SinTraProsegur) Click here to read more about this and other Peruvian labour news. .
Got a photo that should be here? Post it to our group on Flickr. To see an archive of all our recent photos, click here.